Prepare grill for medium-high heat cooking. Cut the eggplant lengthwise and scoop out the flesh using a melon baller or spoon leaving 1inch of the flesh next to the skin to create a bowl. Toss the eggplant flesh and mushrooms with 1 tbsp. olive oil and place on the grill in a grilling basket. Allow the mushrooms and eggplant to grill for approximately 15 minutes until softened and lightly browned, stirring every 3–4 minutes for even cooking. Remove eggplant flesh and mushroom quarters from the grill and finely chop. 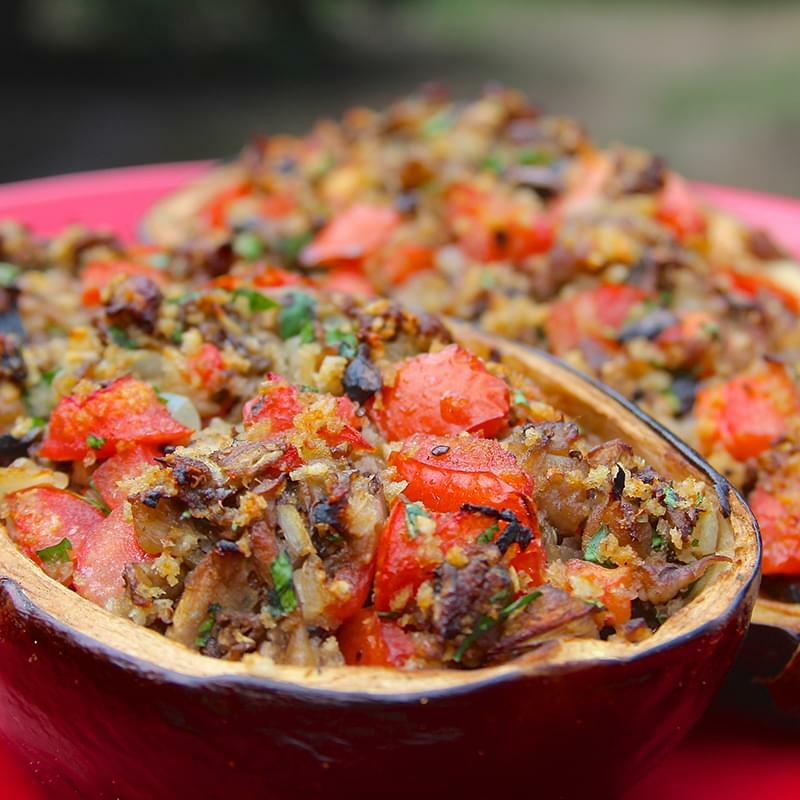 Combine chopped eggplant, mushrooms, tomato, parsley, breadcrumbs, Parmesan, balsamic vinegar, garlic, remaining 2 tbsp. olive oil, and salt and pepper in a large bowl. Stir well to combine then spoon mixture in to the hollowed out eggplant halves. Place the stuffed eggplant on the grill skin side down, cover and allow to cook for 45 minutes. Remove from the grill and enjoy.